Meara O'Reilly is a sound designer, instrument builder, and singer. She builds and writes for Make magazine. Hello! I'm Meara O'Reilly. My thing is auditory perception. I've been exploring this through making instruments, heirloom science demonstrations, auditory illusions, and singing. I write and build things for Make and Craftzine.com. I was in the band Feathers, and have played a lot in Brightblack Morning Light and with Michael Hurley, but now I do my singing alone, sometimes with a chladni plate. Right now I'm trying to make a glass vocoder and I live with the people from Encyclopedia Pictura, at our experimental woodland creative dojo. These next couple of weeks, I'm going to write about new musical instruments and technologies, auditory perception, and inspirational approaches to farming and land management. I'll also profile some incredibly unique musicians and composers that maybe you haven't heard yet. Thanks to Mark for inviting me here, I'm really excited to be a part! Aside from Hermeto's infectiously liberated attitude, this performance is unique as an exploration of the physical edge of two sound mediums. He makes entirely underwater concerts seem tame by comparison. I really love the research that they're doing over at Yale's Haskins Laboratories: instead of studying speech perception and production in terms of faithfully replicating alllll of the sounds we make with our mouths, (like the minute clicks, pops, and hisses of consonants), the team is proposing that all we need to understand speech is to track and re-create a few select resonances of the vocal tract. I like to think of speech production in this context as a series of bottles with varying levels of water in them--the mouth is one bottle that changes pitch resonance when you move it to open it or close it, the nasal cavity another, and so on throughout the vocal tract. It ends up sounding like a bunch of complicated melodies that are then combined into a complex micro-tonal harmony, a.k.a., we're all better at perceiving and making music than we think we are! The examples below break it down into isolated sine-wave patterns that you can combine yourself to build a sentence. What do you think? How easily can you hear words emerge? If you like this, you can go here for more interactive demonstrations, or check out this great sine-wave-synthesized Robert Frost poem. Thanks to Robert E. Remez, as well as Phillip Rubin and Jennifer Pardo at Haskins Labs for allowing me to embed their work here. Coming up, I'll be writing about a cool ethnographic example of a language that actually uses something like this in practice! My documentarian friend Andrea Dunlap over at the Seedling Project pointed out this great footage of a 'scissor dancing' contest in Peru, something she saw when she was living and filming there a few years ago. It happens a few times a year to mark Easter, Christmas, and Yacu Raymi (an annual water festival). Andrea says participants travel everywhere with an entourage of harpists and violinists, doing intricate, rhythmic, often acrobatic dances using pieces of metal shaped like broken scissor halves as percussion, "eventually degenerating into stunts like dancing with cactus stuck all over the dancer's body, breathing fire, throwing firecrackers, etc...They make their own costumes and they have fierce names like Terror of Puquio, and The Lion." And you thought you were rebel for running with scissors! Andrea has some scissor dance footage of her own and more photos from her time in Peru on her site. In addition to her focus on the food movement in California, she's currently working on a documentary about the incredible Cusichaca Trust, a group of archaeologists who are studying ancient Incan agricultural techniques and trying to revive them for modern farmers. From the title of this Victorian science book it's not out of line to assume that there might be at least a few diy methods for accidentally electrocuting yourself, but that's just the beginning. The tome in its entirety is supposed to be available for free as a hi-res e-book sometime this month, but for now you can see a full list of some actually really beautiful sounding demonstrations, (like how to make phosphorescent displays using oyster shells), and some other cool heirloom science excerpts at Lateral Science. Thanks to Tim O'Reilly for the link. He discovered that the cells in the xylem and phloem of the tree fill with air to try to maintain the osmotic pressure that's usually produced by the sucking of water up through the roots. At a certain point the cells burst. Krause adds "When they pop, they make a noise: we can't hear it, but insects can. And when insects hear multiple cells popping, they're drawn to the tree because certain ones are programmed to expect sap. And when the insects are drawn to the tree, the birds are drawn to the tree to eat. it's all a microhabitat formed by sound: The sound of popping cells." (Incidentally, when the xylem cells pop, they die and form the rings of the tree). Recordings are made at their natural high frequency (about 47 kHz!) with a hydrophone and then slowed down by about a factor of seven. Bernie's done some fascinating work in the field of "biophony", which is based around the idea that every animal in an eco-system has its own acoustic territory, or bandwidth of sound that it vocalizes in. If something comes in and takes over a certain bandwidth (like the regular route of a noisy airplane) entire populations can suffer, or be forced to adapt. "Ronnie Moipolai from Kopong village in the Kweneng district 50 km west of the capitol Gaborone. He is 29 years old and goes around the shebeens selling and playing his songs for 5Pula each (80dollarcents). He learned guitar from his now late father, has 3 brothers that also play guitar (KB is one of them), has also a big sister and plenty of kids in the yard. Nobody has a formal job and his mother sells Chibuku beer and firewood they get from the bush trying to make ends meet." Every time I have put this on at least three new conversions occur, where the listeners go on to permanently install this woman's music on their stereo. My neighbor even stalked me once just so she could listen to it more, until I just gave her my extra copy. Emahoy Tsegué-Maryam Guèbrou is a nun currently living in Jerusalem. She grew up as the daughter of a prominent Ethiopian intellectual, but spent much of her young life in exile, first for schooling, and then again during Mussolini's occupation of Ethiopia's capitol city, Addis Ababa, in 1936. Her musical career was often tragically thwarted by class and gender politics, and when the Emperor himself actually went so far as to personally veto an opportunity for Guèbrou to study abroad in England, she sank into a deep depression before fleeing to a monastery in 1948. Today, she spends up to seven hours a day playing the piano in seclusion and even gave a concert to some lucky ducks in Washington D.C. a few years ago. 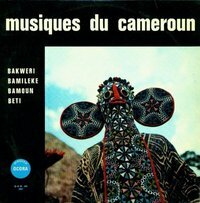 A compilation of her compositions was re-issued on the consistently great Ethiopiques label. You can read more about her life at the Emahoy Music Foundation. This is music made by four postal workers as they cancel postage! When I listen carefully, I think I can actually hear the spring mechanisms as the stamps hit the ink. I love it as an example of music turning what is normally seen as a boring, repetitive task into something this joyful. The song was originally recorded in 1975 at the University of Ghana by James Koetting and appeared on a cd accompanying the book Worlds of Music, but you can download the whole clip here. Thanks to Bernie Krause and Anthropologist Steven Feld for helping me track this one down. I've always been a fan of anything that uses the concept of bone conduction. A friend who worked as a field medic for public protests years ago told me that he'd often diagnose and locate bone fractures by taking a tuning fork, striking it, and holding it against the limb in question--the sound would travel up and down the bone and cause a stronger 'sensation' (ouch!) wherever there was any sort of a break in continuity. Now, thanks to research being done at Carnegie Mellon and Microsoft, you can use this same basic technology to play tetris! The video has a more in-depth demonstration, but the idea is based on the fact that our bodies are pretty effective conductors of minute acoustical information, so vibrations from something like a tap on the forearm or fingertips can be picked up by a bio-acoustic sensor positioned somewhere else along the arm. Because every part of the body is composed of specific combinations of different kinds of tissues with various densities, every location hypothetically has a signature resonance that can be tracked. While it's still in development, they're already teaming the technology up with wearable pico projectors. I think it's really interesting for the future of AR, in terms of creating the ultimate ephemeral user-interface--Tablets are SO 2010. Before they were the first women to become famous on the Grand Ole Opry and the National Barn Dance, The Cackle Sisters, (also known as the DeZurick Sisters) were raised on a farm in Royalton, Minnesota. To develop their unique yodeling style, Caroline De Zurik has said they simply "listened to the birds and tried to sing with the birds." You can hear and download more tracks on wfmu's beware of the blog. I especially love tracks like "Peach Pickin' Time in Georgia","Little Golden Locket" and "Sing Hallelujah", where they seem to hit the sweet spot between their bizarre but amazing stereo-clucks and brilliantly close harmonies. Bernie Krause, (who recorded this clip), says that this baby vulture in Ecuador is using the the tree trunk it's installed in as a resonator to make its voice more intimidating to possible predators. I think it's working! Click on the picture to have a listen. With each frame hand-drawn in pencil and smudged into the next, Oscar-winning animator Frédéric Back tells the story of Elzéard Bouffier, a lone shepherd in the Alps near Provence who boldly decides to single-handedly reforest the desolate valley where he lives, one acorn at a time. Not only is the story defiantly romantic, I'm in love with the way Back's patient devotion to each drawing mimics the methodical tree-planting of his main character. Along with being unabashedly earnest and quietly inspiring, it's some of the most stunning and startlingly original animation that I've seen. I really recommend watching all three parts in one sitting, and especially recommend finding or buying a proper copy of it so you can see it in higher definition, because the detail and motion of it is unreal. The Man Who Planted Trees is based on the short story by Jean Giono. Christopher Plummer narrates, (Phillippe Noiret does the honors in the original French version). I first heard this heart-stopping song from 1919 by Greek singer Marika Papagika on Ian Nagoski's Black Mirror: Reflections in Global Music (a compilation released on the Dust-to-Digital label a few years ago). I have since tried to track down everything else the woman ever sang. Thankfully, Ian is already on the trail for us all, and will be releasing a new compilation of her music on his Canary Records label, an imprint of Portland Oregon's phenomenal Mississippi Records. You'll be able to get it here sometime in May. Listen to more outstanding recordings on his new blog and on-line radio show, fonotopia. This multi-screen video installation by British artist Marcus Coates is both hilarious and fascinating. To create the videos for the project, Coates took slowed-down birdcalls and taught various people to sing them in their slowed-down state. He then filmed them singing the songs in ordinary situations or 'habitats' and sped up the footage again so the birdcalls are at normal speed again. The result is remarkably similar to the original. Click on the picture to see the entire installation in sequence and read a more detailed description of the process. Coates' collaborator on the project, wild-life sound recordist Geoff Sample has posted a bunch of great clips of the bird-songs slowed down by increasing factors here. "Birds are thought to have a finer temporal discrimination of sounds than humans. This means they hear the individual elements of composite sounds that for us appear as a single blurred sound. Their hearing may have up to eight times the temporal resolution that ours can achieve. One way getting some impression of this is by slowing down bird sounds; the simple way of doing this also lowers the pitch of the sound by the same factor and this is a fascinating way of tuning in to the hidden depth of birdsong, a kind of transformation to a more human musical sensibility." Click on the picture to hear a clip. Hollerin' is not for the weak of spirit. It's a long-distance communications device, alarm system, karaoke alternative, and slightly questionable method of telling your girlfriend that you're coming over so she should brush her hair. It's also one of the oldest and most exhilarating-sounding methods of communication that I've heard. This compilation of music on Rounder Records documents a contest held in Spivey's Corner, North Carolina between the years of 1969-1975. If you have a history of Hollerin' in your family, please tell me about it! Read some history and listen to excerpts here. It was Leonard Emmanuel, 1971 Hollerin' champion, who said it best: "There was just as much a need of hollerin' as there was of eatin' at that day and time." Special thanks to Joshua Burkett of the beloved Mystery Train Records in Amherst, MA for sending me this album a few years ago. This post is part of a series about music that disorients the senses. I've found that some of the most amazing and jarring auditory illusions are not the usual scientifically distilled or synthesized ones, they're often found in folk music and made by people's voices. Of course, in a way, it makes perfect sense - the vocal chords are some of the most complex and advanced musical instruments in existence. They are ubiquitously available, and we've been experimenting with them for longer than any other sound-making implement. 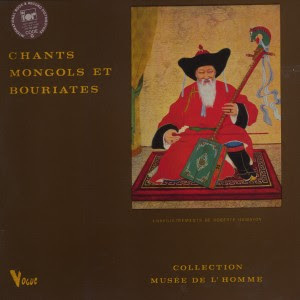 The liner notes say it was recorded in: "Mongolia and Buriatia in 1967, 1968, and 1970 in the course of field work organized in the frame work of the Protocole d'Echanges Culturels between France and Mongolia, and as part of an exchange program with the Academy of Sciences in the USSR." "In Mongolian tradition, neither music nor singing can strictly-speaking be described as specialist activities. In the past, everyone was expected to be capable of singing and playing the fiddle at festivals..."
From the liner notes again: "The player flutes with his nose. Some air really does pass through the nose. The player's lips are slightly parted but do not move: only the corners of the mouth tremble sightly and the cheeks are tensed. This tension brings him out in a sweat. The melody comes from the movements of the tongue. Anyone who possesses this technique is able to reproduce any melody"
For you die-hard record sifters, the info is Vogue Records LDM 30138 (recorded in 1973). Here's a full track-listing. You might be able to download it somewhere if you peek around the internet. ;-) I call for a re-issue! Yesterday I wrote about curator Ian Nagoski's wonderful 78's collection and I thought I'd share another phenomenal collector, Jonathan Ward of the prolific Excavated Shellac blog. This song from Indonesia is totally fantastic--I love the dizzying scales and intonation of the walking guitar in the background in contrast with the sailing violin and vocals. Jonathan says "Krontjong itself is a relatively new type of urban folk music, developing in Indonesian urban areas a little over 100 years ago, with Batavian, Portuguese, Malay, and even African influence". See the original post and many many more at Excavated Shellac. Another fav is this trio of songs "sung by the female duet of Tupou and Fakaua, two ladies-in-waiting of the Tongan queen S?lote Mafile'o Pilolevu Tupou III, who reigned from 1918 to 1965. The young duo were invited to the UK in 1954 and stayed sixteen days. They performed traditional songs for Queen Elizabeth, and recorded six sides for the company on their trip. " For those fortunates in the Los Angeles area, Jonathan will be DJing a set of rare 78's of music from Kurdistan to Madagascar this Sunday, March 28th. Show starts at 3PM at the Los Angeles Municipal Art Gallery, Barnsdall Art Park. More info here. I recently learned that some birds have been found to be able to isolate and control different parts of their vocal tract independently, allowing them to sing simultaneous double tones or alternate between frequencies very rapidly. I'm not sure about the particular species below, but I think it's safe to say that numerous birds on this album are at least using similar 'mad avian skills' to sound like synthesizers. 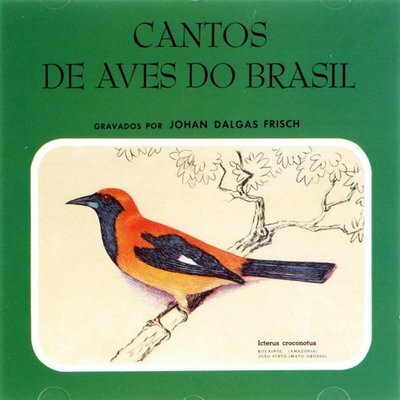 This album, recorded by celebrated ornithologist Johan Dalgas Frisch, (and first released on the Sabia label in 1961), was once in the Top 50 of Brasil's popular record sales. President João Goulart actually gave JFK a copy when he came to visit (click on thumbnail below for photographic evidence). Talk about a country with its musical priorities in the right place! 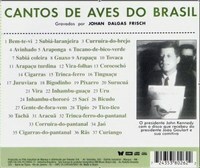 This collection of recordings isn't readily available in the states, but if you can't track down a used LP or torrent, it looks like you can buy it from this site in Brasil. This post is a special 'avian edition' of a series about music that disorients the senses. I've found that some of the most amazing and jarring auditory illusions are not the usual scientifically distilled or synthesized ones, they're often found in folk music and made by people's voices. Of course, in a way, it makes perfect sense - the vocal chords are some of the most complex and advanced musical instruments in existence. They are ubiquitously available, and we've been experimenting with them for longer than any other sound-making implement. Sepp Holzer lives on a mountaintop in Austria, where he casually but thoughtfully manages a fish farm that provides all of his food, clean water, income, and electricity through nothing but a series of carefully placed pond systems. Gravity pulls the water from pond to pond, and little micro-organism-eating fish are gradually replaced by bigger and bigger predatory fish until he has clean water and full-sized trout! It's so simple it might seem like magic, but it's actually cooler than that. You can watch another short profile about Holzer's paradise here, and go here to see Eco Film's entire series on Permaculture. This album from the legenday Ocora label is really one of my favorites on the planet. The liner notes for these songs say that this woman is using her lips as a reed. Full archive and profile here.